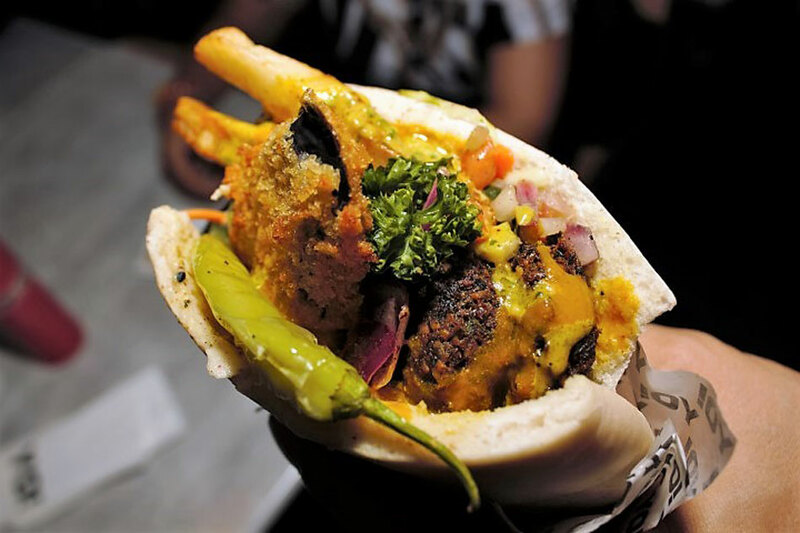 MANILA — From the same group behind Chaplin in Century City Mall, Falafel Yo serves a limited menu featuring — what else but — falafel, giving cinema-goers of Greenbelt 3 a healthy new movie-chow alternative. “We looked at this place when it was offered to us, and we thought that this would be the perfect place for a falafel joint,” said Yuval Mann, one of the owners of Falafel Yo. A full portion of its signature falafel is massive with six pieces of crispy chickpea balls, your choice of Israeli salads, sauces, or even a french fry or two. But there is more to it than just falafel. Dubbed as an Israeli falafel and salad bar, Falafel Yo also aims to make its salads one of its unique selling points by offering authentic tasting dishes using imported Israeli spices and ingredients. Cabbage can be cool and creamy as in the Coleslaw, or punchy and vinegary like in the Sour Cabbage salad. The Tunisian Salad with bellpeppers, radish and carrot gives a refreshing bite dressed with a lemon-white vinaigrette, while their chopped salad keeps it simple with lemon, chopped cucumber, tomato, onions and parsley. Herbs are integral in Israeli cooking, and in the Herbs Mix Salad, each bite gives you that kick of freshness with coriander, parsley, spinach, with some body from pine nuts, and balanced with lemon and pepper. And while you can get a sandwich with all of these salads, you can choose to get your favorite. Mine is the Pickled Onion salad, which may sound very unappetizing but I find gives a most balanced bite of acid, bitterness, and crunch thanks to thinly sliced onions, not to mention that hint of nutty-floral sumac that ties it all together. Besides the salads, other fried toppings can include a fried green chili pepper, fried eggplant slices, and even French fries, which is especially great for kids trying out the smaller pita pocket called Falafelito (which can easily be more than enough for a quick snack, because the Falafel Yo is indeed very hefty). 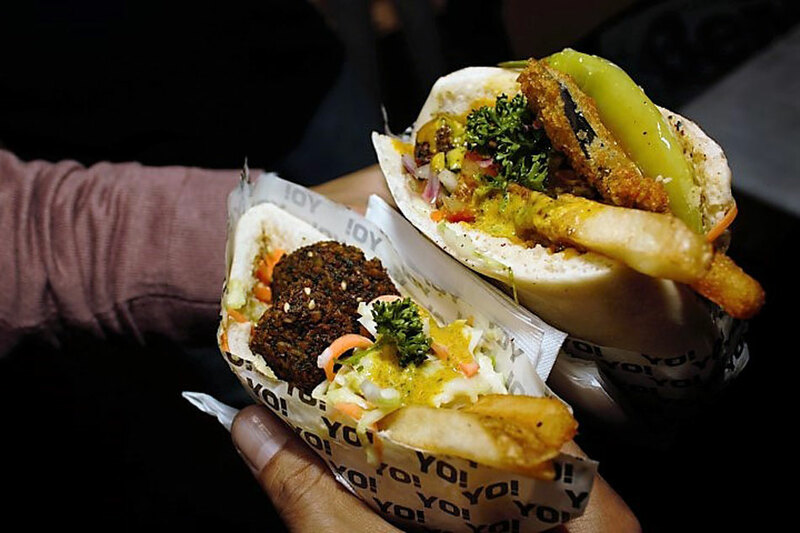 Sauces include a creamy hummus (just in case you wanted more chickpeas in your chickpea sandwich), and instead of going the more usual garlic sauce (toum), or yogurt sauce, Falafel Yo introduces two Israeli sauces. The first is a Tahini sauce, which is the more accessible of the two, made from sesame seeds with a slight garlic backnote, while the other is the more adventurous tasting Amba. 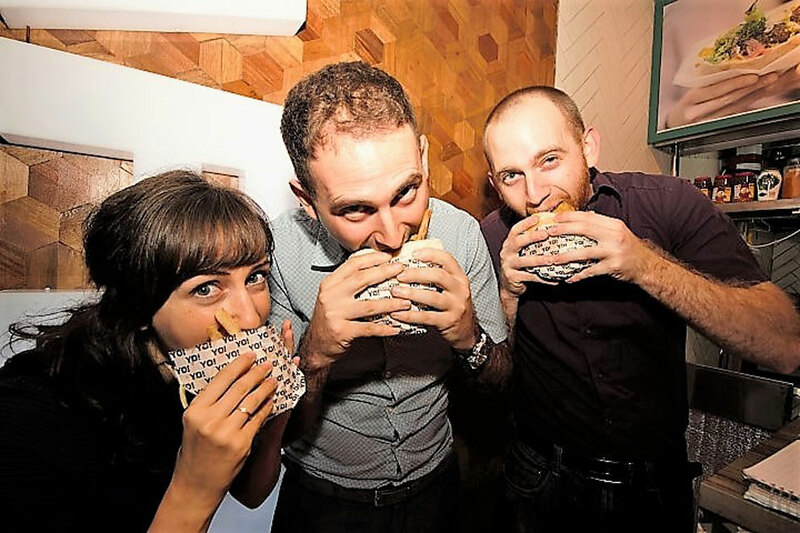 “We just wanted the same experience of how we eat in Israel. In Israel, there is no garlic sauce; there is Amba, and there is Tahini, and that is what we have brought here,” shared Mann. Amba is a sauce made of mango, using the ripe kind, simmered for hours with turmeric and lemon. Definitely one of the most complex sauces I’ve tasted on a falafel sandwich — fruity sweet, lemony sour, with the turmeric not exactly giving a gingery note, but a subtle backnote finish of spice. It grew on me, and I found myself adding more of this in the course of eating my sandwich. Meat lovers feeling out of place? Falafel Yo also offers the Falafel Beast. The beast is what happens when a shawarma (or any Middle Eastern meat sandwich) and a falafel sandwich come together. This protein-heavy dish has been made (as far as the owners know) only in the Philippines. If things get too spicy (especially if you opt to get that fried green chili pepper), order the Lemon Grass Tea. Not to be confused with a juice concoction with lemongrass, this is like an icy virgin mojito – lemon, and tons and tons of mint, the “grass.” Best enjoyed when it’s slushy. Sed dui lorem, adipiscing in adipiscing et, interdum nec metus. Mauris ultricies, justo eu convallis placerat, felis enim ornare nisi, vitae mattis nulla ante id dui.